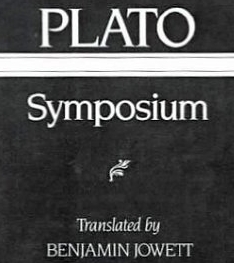 It is claimed that in Symposium there are more than the author himself knew. 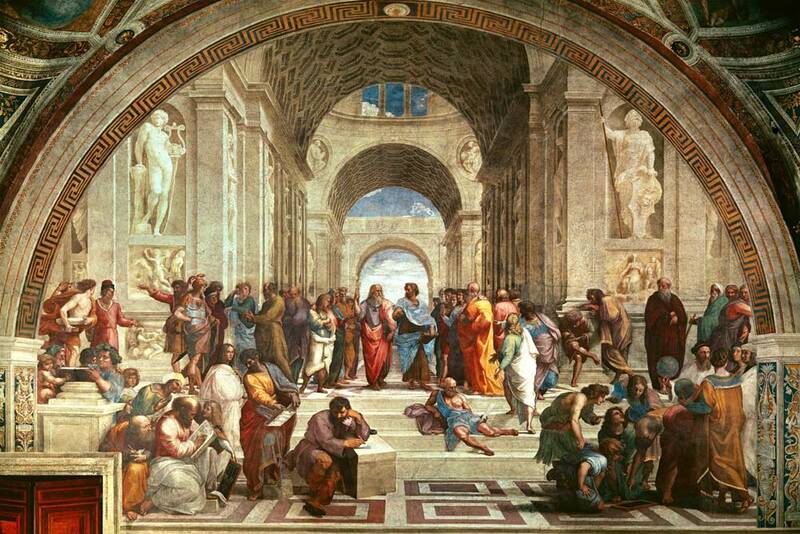 The Symposium of Plato is a work of his character, and can with difficulty be rendered in any words but the writer’s own. There are so many half-lights and cross-lights, so much of the color of mythology, and of the manner of sophistry adhering—rhetoric and poetry, the playful and the serious, are so subtly intermingled in it, and vestiges of old philosophy so curiously blend with germs of future knowledge, that agreement among interpreters is not to be expected. The power of love is represented in the Symposium as running through all nature and all being: at one end descending to animals and plants, and attaining to the highest vision of truth at the other. Love became a mythic personage whom philosophy, borrowing from poetry, converted into an efficient cause of creation. Yet there is a higher region in which love is not only felt, but satisfied, in the perfect beauty of eternal knowledge, beginning with the beauty of earthly things, and at last reaching a beauty in which all existence is seen to be harmonious and one. The limited affection is enlarged, and is enabled to behold the ideal of all things. …At first immortality means only the succession of existences; even knowledge comes and goes. Then follows, in the language of the mysteries, a higher and a higher degree of initiation; at last we arrive at the perfect vision of beauty, not relative or changing, but eternal and absolute; not bounded by this world, or in or out of this world, but an aspect of the divine, extending over all things, and having no limit of space or time: this is the highest knowledge of which the human mind is capable. So Plato would have us absorb all other loves and desires in the love of knowledge. Here is the beginning of Ne-oplatonism, or rather, perhaps, a proof (of which there are many) that the so-called mysticism of the East was not strange to the Greek of the fifth century before Christ. …after Chaos, the Earth and Love, these two, came into being. I speaking of the sense of honor and dishonor, without which neither states nor individuals ever do any good or great work. And I say that a lover who is detected in doing any dishonorable act, or submitting through cowardice when any dishonor is done to him by another, will be more pained at being detected by his beloved than at being seen by his father, or by his companions, or by anyone else. And if there were only some way of contriving that a state or an army should be made up of lovers and their loves, they would be the very best governors of their own city, abstaining from all dishonor, and emulating one another in honor; and when fighting at each other’s side, although a mere handful, they would overcome the world. Love makes the veriest coward to become an inspired hero, equal to the bravest. That courage which, as Homer says, the god breathes into the souls of some heroes, Love of his own nature infuses into the lover. Love will make men dare to die for their beloved—love alone; and women as well as men. Of this, Alcestis, the daughter of Pelias, is a monument to all Hellas; for she was willing to lay down her life on behalf of her husband, when no one else would, although he had a father and mother; but the tenderness of her love so far exceeded theirs, that she made them seem to be strangers in blood to their own son, and in name only related to him; and so noble did this action of hers appear to the gods, as well as to men, that among the many who have done virtuously she is one of the very few to whom, in admiration of her noble action, they have granted the privilege of returning alive to earth; such exceeding honor is paid by the gods to the devotion and virtue of love. And greatly as the gods honor the virtue of love, still the return of love on the part of the beloved to the lover is more admired and valued and rewarded by them, for the lover is more divine; because he is inspired by God. Take, for example, that which we are now doing, drinking, singing and talking—these actions are not in themselves either good or evil, but they turn out in this or that way according to the mode of performing them; and when well done they are good, and when wrongly done they are evil; and in like manner not every love, but only that which has a noble purpose, is noble and worthy of praise. The Love who is the offspring of the common Aphrodite is essentially common, is of the body rather than of the soul—the most foolish beings are the objects of this love which desires only to gain an end, but never thinks of accomplishing the end nobly, and therefore does good and evil quite indiscriminately. Consider, too, how great is the encouragement which all the world gives to the lover; neither is he supposed to be doing anything dishonorable; but if he succeeds he is praised, and if he fail he is blamed. And in the pursuit of his love the custom of mankind allows him to do many strange things, which philosophy would bitterly censure, if they were done from any motive of interest, or wish for office or power. He may pray, and entreat, and supplicate, and swear, and lie on a mat at the door, and endure a slavery worse than that of any slave—in any other case friends and enemies would be equally ready to prevent him, but now there is no friend who will be ashamed of him and admonish him, and no enemy will charge him with meanness or flattery; the actions of a lover have a grace which ennobles them; and custom has decided that they are highly commendable and that there no loss of character in them; and, what is strangest of all, he only may swear and forswear himself (so men say), and the gods will forgive his transgression, for there is no such thing as a lover’s oath. Such is the entire liberty which gods and men have allowed the lover, according to the custom which prevails in our part of the world. Evil is the vulgar lover who loves the body rather than the soul, inasmuch as he is not even stable, because he loves a thing which is in itself unstable, and therefore when the bloom of youth which he was desiring is over, he takes wing and flies away, in spite of all his words and promises; whereas the love of the noble disposition is life-long, for it becomes one with the everlasting. There is a dishonor in being overcome by the love of money, or of wealth, or of political power, whether a man is frightened into surrender by the loss of them, or, having experienced the benefits of money and political corruption, is unable to rise above the seductions of them. For none of these things are of a permanent or lasting nature; not to mention that no generous friendship ever sprang from them. …and when, as I was saying, the elements of hot and cold, moist and dry, attain the harmonious love of one another and blend in temperance and harmony, they bring to men, animals, and plants health and plenty, and do them no harm; whereas the wanton love, getting the upper hand and affecting the seasons of the year, is very destructive and injurious, being the source of pestilence, and bringing many other kinds of diseases on animals and plants. In the first place, let me treat of the nature of man and what has happened to it; for the original human nature was not like the present, but different. The sexes were not two as they are now, but originally three in number; there was man, woman, and the union of the two, having a name corresponding to this double nature, which had once a real existence, but is now lost, and the word ‘Androgynous’ is only preserved as a term of reproach. In the second place, the primeval man was round, his back and sides forming a circle; and he had four hands and four feet, one head with two faces, looking opposite ways, set on a round neck and precisely alike; also four ears, two privy members, and the remainder to correspond. He could walk upright as men now do, backwards or forwards as he pleased, and he could also roll over and over at a great pace, turning on his four hands and four feet, eight in all, like tumblers going over and over with their legs in the air; this was when he wanted to run fast. Now the sexes were three, and such as I have described them; because the sun, moon, and earth are three; and the man was originally the child of the sun, the woman of the earth, and the man-woman of the moon, which is made up of sun and earth, and they were all round and moved round and round like their parents. Terrible was their might and strength, and the thoughts of their hearts were great, and they made an attack upon the gods; dared to scale heaven, and would have laid hands upon the gods. Doubt reigned in the celestial councils. Should they kill them and annihilate the race with thunderbolts, as they had done the giants, then there would be an end of the sacrifices and worship which men offered to them; but, on the other hand, the gods could not suffer their insolence to be unrestrained. At last, after a good deal of reflection, Zeus discovered a way. He said: I have a plan which will humble their pride and improve their manners; men shall continue to exist, but I will cut them in two and then they will be diminished in strength and increased in numbers; this will have the advantage of making them more profitable to us. They shall walk upright on two legs, and if they continue insolent and will not be quiet, I will split them again and they shall hop about on a single leg.’ He spoke and cut men in two, and as he cut them one after another, he bade Apollo give the face and the half of the neck a turn in order that the man might contemplate the section of himself: he would thus learn a lesson of humility. Apollo was also bidden to heal their wounds and compose their forms. So he gave a turn to the face and pulled the skin from the sides all over that which in our language is called the belly, like the purses which draw in, and he made one mouth at the center, which he fastened in a knot (the same which is called the navel); he also molded the breast and took out most of the wrinkles, much as a shoemaker might smooth leather upon a last; he left a few, however, in the region of the belly and navel, as a memorial of the primeval state. After the division the two parts of man, each desiring his other half, came together, and throwing their arms about one another, entwined in mutual embraces, longing to grow into one, they were on the point of dying from hunger and self-neglect, because they did not like to do anything apart; and when one of the halves died and the other survived, the survivor sought another mate, man or woman as we call them,—being the sections of entire men or women,—and clung to that. They were being destroyed, when Zeus in pity of them invented a new plan: he turned the parts of generation round to the front, for this had not been always their position, and they sowed the seed no longer as hitherto like grasshoppers in the ground, but in one another; and after the transposition the male generated in the female in order that by the mutual embraces of man and woman they might breed, and the race might continue, and go their ways to the business of life: so ancient is the desire of one another which is implanted in us, reuniting our original nature, making one of two, and healing the state of man. Each of us when separated, having one side only, like a flat fish, is but the indenture of a man, and he is always looking for his other half. Men who are a section of that double nature which was once called Androgynous are lovers of women; adulterers are generally of this breed, and also adulterous women who lust after men: the women who are a section of the woman do not care for men, but have female attachments; the female companions are of this sort. And so the human nature was originally one and we were a whole, and the desire and pursuit of the whole is called love. There was a time, I say, when we were one, but now because of the wickedness of mankind God has dispersed us. And if we are not obedient to the gods, there is a danger that we shall be split up again like the profile figures having only half a nose which are sculptured on monuments, and that we shall be like tallies. Wherefore let us exhort all men to piety, that we may avoid evil, and obtain the good, of which Love is to us the lord and minister; and let no one oppose him—he is the enemy of the gods who opposes him. For if we are friends of the God and at peace with him we shall find our own true loves, which rarely happens in this world at present. My words have a wider application—they include men and women everywhere; and I believe that if our loves were perfectly accomplished, and each one returning to his primeval nature had his original true love, then our race would be happy. And if this would be best of all, the best in the next degree and under present circumstances must be the nearest approach to such an union; and that will be the attainment of a congenial love. Wherefore, if we would praise him who has given to us the benefit, we must praise the god Love, who is our greatest benefactor, both leading us in this life back to our own nature, and giving us high hopes for the future, for he promises that if we are pious, he will restore us to our original state, and heal us and make us happy and blessed. Let us adduce a similar proof of the tenderness of Love; for he walks not upon the earth, nor yet upon the skulls of men, which are not so very soft, but in the hearts and souls of both gods and men, which are of all things the softest: in them he walks and dwells and makes his home. Not in every soul without exception, for where there is hardness he departs, where there is softness there he dwells; and nestling always with his feet and in all manner of ways in the softest of soft places. ….And a proof of his flexibility and symmetry of form is his grace, which is universally admitted to be in an especial manner the attribute of Love; ungrace and love are always at war with one another. The fairness of his complexion is revealed by his habitation among the flowers; for he dwells not amid bloomless or fading beauties, whether of body or soul or aught else, but in the place of flowers and scents, there he sits and abides. …He is also the source of poesy in others, which he could not be if he were not himself a poet. And at the touch of him every one becomes a poet, even though he had no music in him before, this also is a proof that Love is a good poet and accomplished in all the fine arts; for no one can give to another that which he has not himself, or teach that of which he has no knowledge. He Who will deny that the creation of the animals is his doing? Are they not all the works of his wisdom, born and begotten of him? And as to the artists, do we not know that he only of them whom love inspires has the light of fame?—he whom Love touches not walks in darkness. …In the days of old, as I began by saying, dreadful deeds were done among the gods, for they were ruled by Necessity; but now since the birth of Love, and from the Love of the beautiful, has sprung every good in heaven and earth. Therefore, Love is the fairest and best in himself, and the cause of what is fairest and best in all other things. This is he who empties men of disaffection and fills them with affection, who makes them to meet together at banquets, in sacrifices, feasts, dances, he is our lord—who sends courtesy and sends away discourtesy, who gives kindness ever and never gives unkindness; the friend of the good, the wonder of the wise, the amazement of the gods; desired by those who have no part in him, and precious to those who have the better part in him; parent of delicacy, luxury, desire, fondness, softness, grace; regardful of the good, regardless of the evil: in every word, work, wish, fear—saviour, pilot, comrade, helper; glory of gods and men, leader best and brightest: in whose footsteps let every man follow, sweetly singing in his honour and joining in that sweet strain with which love charms the souls of gods and men. He who desires something is in want of something, and that he who desires nothing is in want of nothing. Would he who is great, desire to be great, or he who is strong, desire to be strong? He who is anything cannot want to be that which he is. Love is of something which a man wants and has not. Then Love wants and has not beauty. Is not the good also the beautiful? And now I would rehearse a tale of love which I heard from Diotima, a woman wise in this and in many other kinds of knowledge. She was my instructress in the art of love, and I shall repeat to you what she said to me. I must speak first of the being and nature of Love, and then of his works. First I said to her that Love was a mighty god, and likewise fair; and she proved to that, by my own showing, Love was neither fair nor good. ‘The possession of the good,’ I said. ‘You are right.’ I said. Again I replied that I did not know. She said: think only of the ambition of men, and you will wonder at the senselessness of their ways, unless you consider how they are stirred by the love of an immortality of fame. They are ready to run all risks greater far than they would have run for their children, and to spend money and undergo any sort of toil, and even to die, for the sake of leaving behind them a name which shall be eternal. ‘I am persuaded that all men do all things, and the better they are the more they do them, in hope of the glorious fame of immortal virtue; for they desire the immortal. ‘Those who are pregnant in the body only, betake themselves to women and beget children—this is the character of their love; their offspring, as they hope, will preserve their memory and giving them the blessedness and immortality which they desire in the future. But souls which are pregnant—for there certainly are men who are more creative in their souls than in their bodies—conceive that which is proper for the soul to conceive or contain. And what are these conceptions?—wisdom and virtue in general. And such creators are poets and all artists who are deserving of the name inventor. But the greatest and fairest sort of wisdom by far is that which is concerned with the ordering of states and families, and which is called temperance and justice. And he who in youth has the seed of these implanted in him and is himself inspired, when he comes to maturity desires to beget and generate. He wanders about seeking beauty that he may beget offspring—for in deformity he will beget nothing—and naturally embraces the beautiful rather than the deformed body; above all when he finds a fair and noble and well-nurtured soul, he embraces the two in one person, and to such an one he is full of speech about virtue and the nature and pursuits of a good man; and he tries to educate him; and at the touch of the beautiful which is ever present to his memory, even when absent, he brings forth that which he had conceived long before, and in company with him tends that which he brings forth; and they are married by a far nearer tie and have a closer friendship than those who beget mortal children, for the children who are their common offspring are fairer and more immortal. Who, when he thinks of Homer and Hesiod and other great poets, would not rather have their children than ordinary human ones? Who would not emulate them in the creation of children such as theirs, which have preserved their memory and given them everlasting glory? And many others there are in many other places, both among Hellenes and barbarians, who have given to the world many noble works, and have been the parents of virtue of every kind; and many temples have been raised in their honor for the sake of children such as theirs; which were never raised in honor of any one, for the sake of his mortal children. …that in the attainment of this end human nature will not easily find a helper better than love.